In the production of glass, the melting of raw materials consumes a vast amount of energy, resulting in a relatively high burden on the environment. 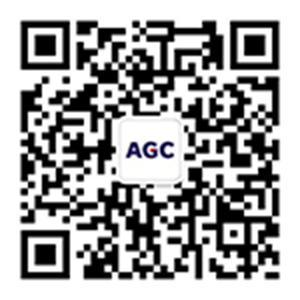 Therefore, the AGC Group developed in-flight melting technology* 1—a revolutionary glass production method—with the goal of reducing energy consumption by half for those operations. Since this technology can instantly melt raw materials through the use of plasma and oxy-acetylene flames, it greatly reduces energy use if practically implemented. 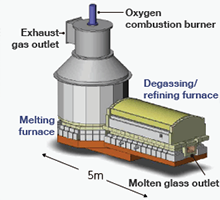 The Group succeeded in melting raw materials using the world’s lowest rate of energy consumption through a small-scale melting furnace (production capacity of one ton of glass per day) in 2012, and is currently conducting a series of tests on small-scale furnaces with a view to make full use of the technology in the future. The production of chemicals such as caustic soda consumes large amounts of electricity. Therefore, AGC Group companies are working to reduce their environmental load by steadily shifting the fuel used in power generation equipment from heavy oil to natural gas. Switching the fuel to natural gas leads to lower emissions of CO2 and also greatly reduces emissions of soot, dust, sulfur oxides (SOx) and nitric oxides (NOx). In 2013, a new type of gas turbine generator was installed at the AGC Chiba Plant. The new generator can also be utilized to produce steam used at the plant, thereby eliminating the need for producing steam separately, and reducing energy consumption. By installing the new gas turbine generator, the Chiba Plant has succeeded in lowering its CO2 emissions by approximately 50,000 tons annually. In 2013, the AGC Group completed a new plant in Guarantinguetá, in the Brazilian state of São Paulo, to produce architectural glass and automotive glass. Equipped with advanced technologies for treating exhaust gases, saving energy and conserving water, the plant is currently recognized as having the lowest environmental impact among glass production factories in South America. After a huge new investment, in 2017 AGC Vidros do Brasil opened, including a second architectural glass production line using the same advanced technologies that minimize environmental impact. From the time construction commenced in 2011, the Group joined the local government in environmental activities to restore vegetation and protect local wildlife in the vicinity. Since that year, 19,500 trees of a total of 33,000 scheduled for replanting have been planted around the new facility.